OpenSocial, Google's API for social gadgets, has been launched to the public. The API is supported by many social networks, including MySpace and orkut, but it's still not ready for prime time (Plaxo is the first site that lets you add social gadgets to your profile). orkut added something new: an application that lets you ask your friends questions. It wasn't developed using OpenSocial, but it's a perfect example of an useful social gadget. You can find it at the top of the feeds page. Ask Friends (or Mobius, probably a reference to the Möbius strip) has two clever features that make it non-trivial. 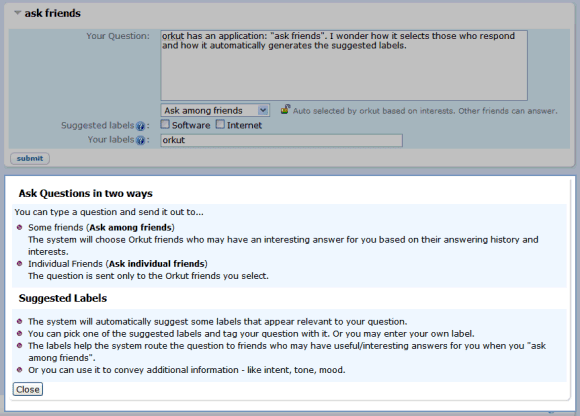 Based on your question, orkut automatically generates a list of labels, probably from an existing database. Using these labels and other labels entered by you, orkut determines what friends are most likely to have an answer for your question. "The system will choose Orkut friends who may have an interesting answer for you based on their answering history and interests." There's also an option to select the friends that can view and answer your question.